This is something of a disappointing photo of Venus. I've been watching it in binoculars as it grows into a longer and thinner crescent every day. Last night, about 8 hours ago, was the first time I could clearly see a crescent shape at a magnification of 7x. Only 6.6% of Venus' surface was illuminated. 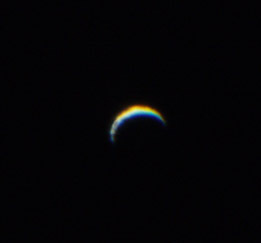 But the sky, though clear, was turbulent, and this photo through the telescope shows a crescent that's a little too fat. I took 70 photos, and this was the best. Oh well. Nice way to see out the old year anyway. On January 13, Venus will pass in front of the sun (above it, actually), and will become a morning star again. I look forward to increasingly conspicuous crescents until then.